I recently attended a presentation/workshop by Aaron Lish at the Caetani Cultural Centre here in town. Aaron is an artist from Bend, Oregon who was invited to be Artist in Residence at the Centre. Aaron suggests that items from nature such as water, trees, waterfalls, wind, can produce self-portraits. His suggestion created the impetus to see what self-portrait ice could actually produce. So how is that possible you ask. With a bit of help from me, here’s how. Old cotton handkerchiefs were soaked in soda ash, scrunched and placed on a rack suspended above a pan. I covered them entirely with ice cubes and then sprinkled a quarter teaspoon each of blue and red dye powder over top of the ice. Now it was a matter of waiting for the ice to melt to see what would happen. The ice melted overnight, soaking the handkerchiefs with dye and leaving a patterning that in some instances melded the two colours, creating another colour. Here are pictures of the finished "painting" by ice. 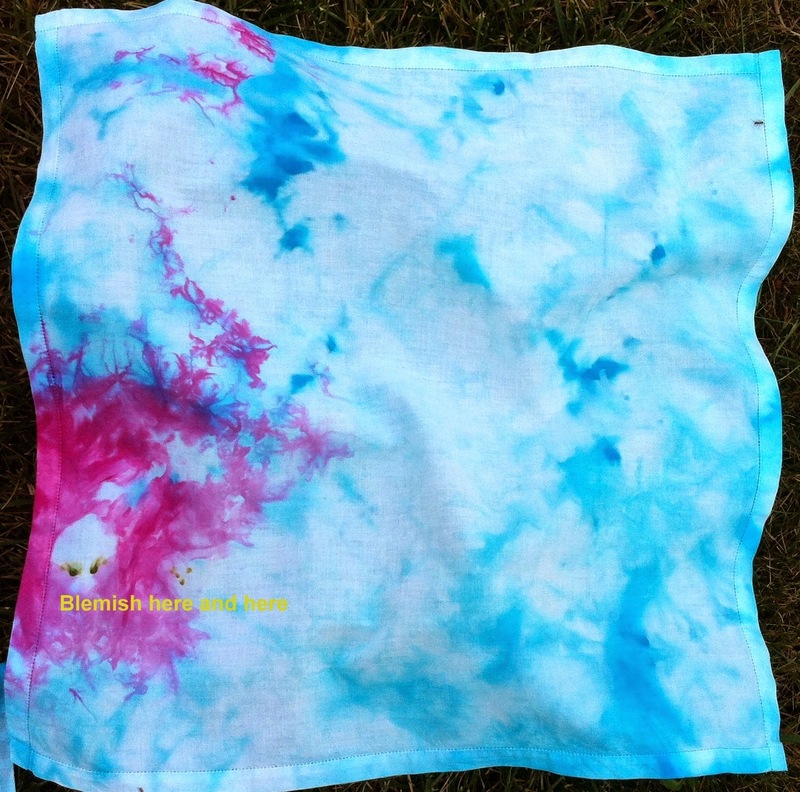 On one handkerchief you will notice a “blemish” unrelated to the dye powder colours. You could speculate that there was either an imperfection in the ice, dye powder, or the fabric itself. Aaron was invited to exhibit at Allan Brooks Nature Centre, the works of those who had attended his workshop. So these are currently on display at the Nature Centre for a short while. I enjoyed the process so much, I decided to try this again. This time, I chose to simply fold PFD cotton scraps before covering them with ice cubes and dye. I chose different colours too. Here is what happened this time. You can see where the fabric had been folded and this time the imprint of the rack supporting the fabric is also visible. I wonder what would happen if I started with dry fabric. Would the "wicking" effect create different patterning? should I use less ice and would this create a more "organized" patterning? Would the result be different if paper or felt had been used? Hmmm.... some thought for further "what if" play. Till the next time, "dance" like no one is watching! My, you have been busy. I am way behind in reading blogs. Lovely fabric dying experiments.